Seedbox Guide found another simple yet promising seedbox provider. SeedVPS is one of the latest providers that provides Linux and Windows VPS served in The Netherlands. This review focuses on Ultimate seedbox plan with 2000GB storage in a 8 cores at 2.4GHz with 8GB RAM. This plan has a bandwidth of 16TH with 1Gbps uplink. By request of Seedbox Guide, a default and recommended bittorrent client rutorrent is installed and being tested. The SeedVPS plan 2000GB will have at least near to the ideal 1Gbps uplink. Speed is one of the important aspects that a client would be looking for and asking from seedbox providers. Based from our experience. SeedVPS performs remarkably when we talk about speed. We would like to present two screenshots below that gives us a clear picture by comparing them within a time span. 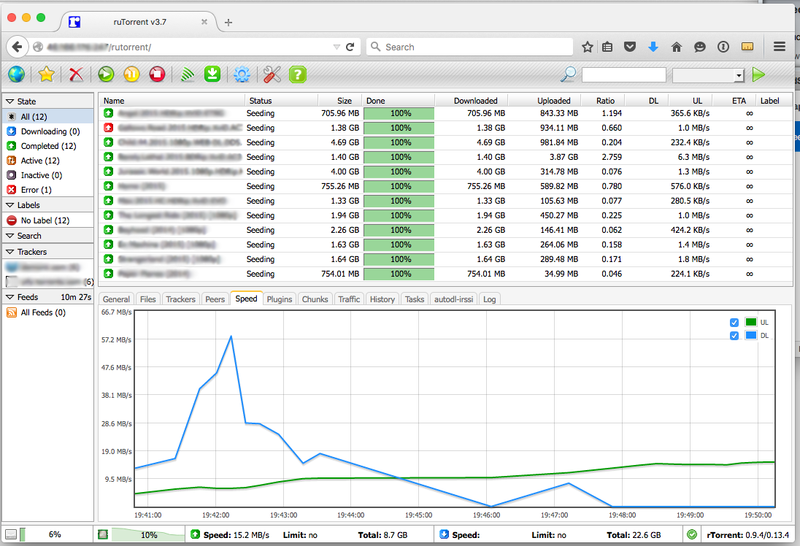 First screenshot shows an incredible download speed that is taking place for 4 torrent files being downloaded at an average speed of 44.1 Mb/s. This is a good start for a freshly installed and newly used seedbox. Notice that the peak speed being reach in less than 10 minutes. On this second screenshot, a remarkable performance is noticeable. in less than an hour. All 12 torrent files of different sizes were downloaded, and uploading activity speed increases gradually with an average of 15.2 MB/s. From our experience, it increase further as of this writing. Customer’s satisfaction is guaranteed at its best as we were in communication with SeedVPS. Politeness and responsiveness for technical and non-technical needs were shown by the support team. A quick response to our ticket opened would show their sincerity in discussing issues that other clients may encounter as they enjoy SeedVPS products and services. One of the best feature that SeedVPS in par with other providers is their client control panel. The simplicity of the dashboard helps a lot in order for the client to see what’s really happening to his seedbox. The details for the seedbox’s status, information and statistics for bandwidth, memory, vswap and disk usage are readily available. SeedVPS makes it easy for the client to reboot, shutdown, reinstall and log for the logs and configure networking; all in a one page dashboard. Lastly, you would be able to see the traffic in a nicely presented graphical representation for the incoming, outcoming speed for a desired time span. See it below.